Please submit your digital signage content for promotional consideration on screens in the Irving K. Barber Learning Centre. In order to effectively consider your request, ensure that all fields are completed. - Fields marked with an asterisk are required to submit the form. - Requests should be submitted at least 1 week prior to the Posting Start Date as insufficient lead time may result in a denial of your request. For any questions, please contact ikblc.bookings@ubc.ca. Please indicate when you would like your content to start playing. We can display your content up to 2 weeks in advance of your start date. See UBC Digital Signage - Submission for more information. If YES, please indicate the filename of your content already uploaded to the central UBC Digital Signage network, as provided to you. This allows us to avoid duplicate uploads of signage content. - Ensure that your content meets our formatting guidelines and content specifications. 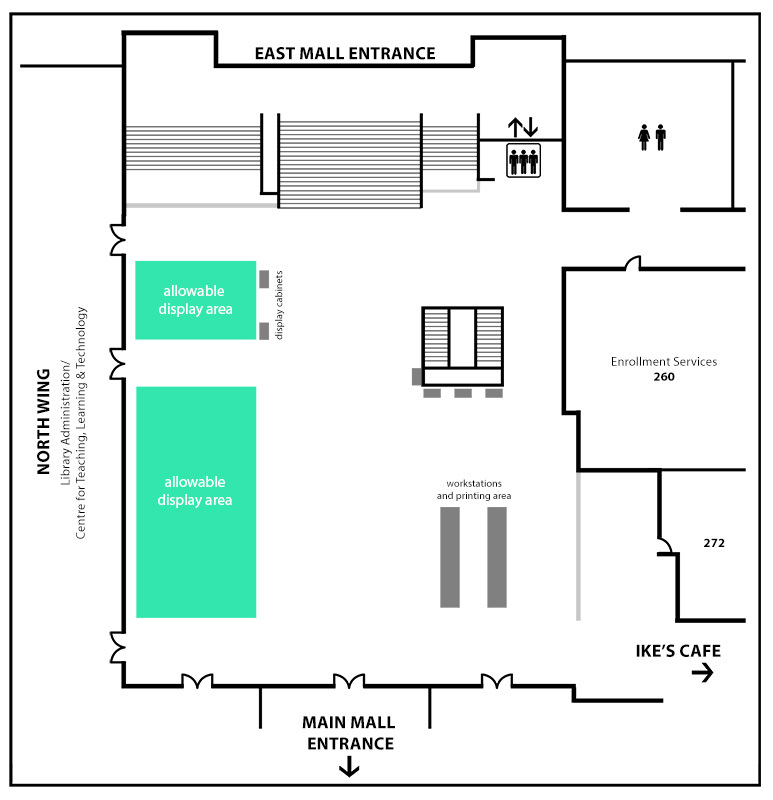 Please submit your request to book the Level 2 foyer (map) of the Irving K. Barber Learning Centre. In order to effectively consider your request, provide full details of your proposed foyer event as best as possible. - Allow up to 4 business days for a response as building stakeholders have to be consulted while assessing your request. For any questions, please contact IKBLC Bookings. The Level 2 foyer may be reserved by UBC organizations and departments only to promote learning-related activities and opportunities. Our vision is to highlight learning support programs and services that engage and enhance students' academic success and wellness. Note that we cannot host UBC clubs. Please provide a detailed description of your proposed foyer event below, specifying how it will contribute to the above vision and including any relevant website links. Your request will not be processed without a valid description. This description may be edited to be made publicly available in UBC Library newsletters. In the event the above date is unavailable, select an alternate date below. This time is inclusive of all set up and take down activities before and after your event. Event organizers are responsible for renting all necessary furniture and coordinating the delivery and pick up of rentals. Please note that IKBLC has no provisions for the storage of event materials. Please coordinate with your caterer to ensure that all catering items are promptly removed following the end of the event. Do you require advanced digital signage promotion? This entails the promotion of your event on electronic screens in the foyer up to 2 weeks before your event. For event promotion elsewhere on campus, visit UBC Digital Signage. The following terms and conditions apply for requests and if confirmed, for the duration of your foyer event in the Barber Learning Centre. Non-compliance with the following policies may result in the denial of future booking requests. Please scroll down to review our policies and to submit your agreement and completed form below. • Foyer requests are confirmed on a first-come, first-served basis and are subject to approval and availability. In the interest of minimizing the impact on students studying in the space, IKBLC has a limited number of bookings for the foyer each term. • For health and safety reasons, the distribution of beverages, baked goods, or other open food is not permitted. • Single serving packaged food, such as granola bars and tea bags, are acceptable. • Posters and banners are not to be attached to any part of the building and will be removed immediately; groups may be charged for any resulting damage to the building interior. • Standing sign holders for promotional material may be available for borrowing upon request, subject to availability. • IKBLC does not have any provisions for the storage of any event materials. • In the event, your foyer booking has to be cancelled or re-scheduled, please provide as much advance notification as possible. This form represents the complete understanding and agreement of the parties with respect to the booking of the Level 2 foyer in the Irving K. Barber Learning Centre. The Administration reserves the right to modify these guidelines or make additional conditions, as it deems necessary to ensure the success of your event. I have read and agree to the Terms and Conditions listed above.